It is very hard to resist Pacific coastline golf courses. While not located right on the Pacific Ocean, you will find excellent Santa Barbara golf deals at Santa Barbara Golf Club in Central California. This beautiful course provides a wonderful view of the Santa Ynez foothills and the Pacific Ocean along a stretch of the Ventura (101) and Pacific Coasts (1) highways. 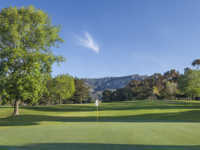 The Santa Barbara Golf Club was designed by William Hughes and was opened for business in 1958. This 18 hole course (par 70) covers 6,022 yards from the championship (blue) tees. The course has a rating of 69.4 with a slope of 123 on Kikuyu grass. As with most courses close to the ocean, the greens are contoured and put extra emphasis on putting. There are sufficient enough hazards to make this course play a bit longer than the yardage. When making your Santa Barbara tee times, you should inquire into the Santa Barbara Golf Club discounts offered on a daily basis. Reservations may be handled online or through the course starter. Amenities include a driving range, putting green, 1,800 sq. ft. pro shop, cart and club rentals, and Mulligans Cafe. Players enjoy the well kept fairways and green. Driving accuracy is important to assure easy placement on the green below the cup in order to avoid difficult putts.